Axial has been on quite a tear as of late, releasing three new (or updated) models into the wild. If you’re a fan of R/C crawler kits, the new SCX10 II UMG10 offers a blend of familiarity in a new package. Based on a “Unimog-style” vehicle, this cab-over axle utility machine serves up a variety of customization options right out of the box. 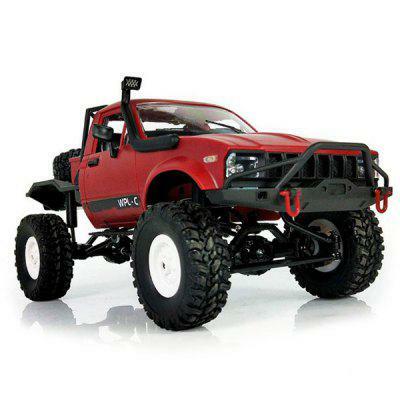 After you apply some creativity, you can have an R/C crawler that’s truly one of a kind. Based on the SCX10 II platform, the UMG10 provides a new body style and open bed/rear cage design that’s perfect for creating a military-style scaler or any other type of rough-and-tumble creation you can cook up. Included in the kit are features such as aluminum suspension links, aluminum shock bodies, one-piece AR44 axles, among other goodies. The gearbox design is the same that’s found in other SCX10 II kits and includes all metal gears and a low-cg transfer case. Outside of the internal aspects, this kit includes a detailed interior with a variety of customization options including three headgear options for the driver figurine and other in-cab levers. Eight LED mounting locations can be found throughout the grille and rear section of the UMG10, giving you the option of adding lights to your rig for nighttime driving. Another new aspect of this kit are the wheels and tires. Patterned after military-style vehicles, the MT45 tires and 1.9″ beadlock wheels offer an aggressive appearance which should also perform quite well on outdoor terrain. The items required to complete this kit build are a 2.4GHz radio system (transmitter and receiver), a steering servo, an ESC, a 540-size motor, a 2-cell LiPo or 6-cell NiMh battery and compatible battery charger, polycarbonate paint, and assembly tools. Priced at $299.99, the Axial SCX10 II UMG10 will be available online, as well as through your favorite Axial dealers. Visit axialracing.com to learn more about this R/C crawler kit.